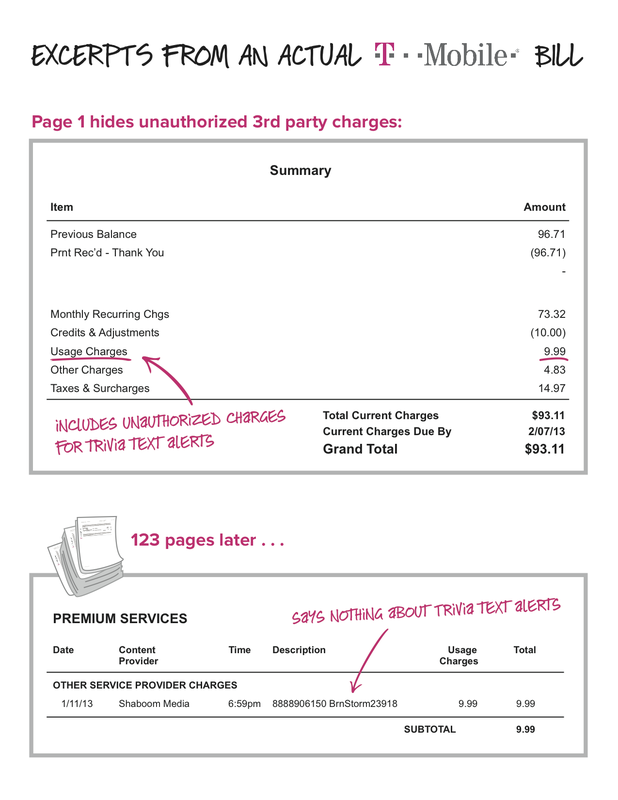 This sample provided by the FTC demonstrates how T-Mobile allegedly hid these charges from consumers. T-Mobile, a company that has tried to position itself as being consumer-friendly, has been accused by federal regulators of being anything but friendly. The self-described “Un-carrier” has been accused in federal court of making hundreds of millions of dollars off of so-called “premium” text-messaging subscriptions that were often never requested by subscribers. According to the complaint [PDF] filed by the Federal Trade Commission in a U.S. District Court in Seattle, T-Mobile allowed third parties to participate in what’s known as “bill cramming,” the placing of often-questionable charges for premium services on a phone customers’ bill. Making matters worse, the government claims that T-Mobile sometimes continued to bill customers for these services even after being made aware that they were being operated by scammers. The FTC says that the demand for refunds on these charges were high, with sometimes as many as 40% of affected users requesting refunds for the charges. If that wasn’t enough of an indicator that the charges were fake, then the FTC says that industry auditor alerts, law enforcement actions, and news articles should have been a sign to stop collecting these for the scam artists. Another thing that makes the cramming all the more serious is T-Mobile’s large numbers of prepaid customers who don’t receive bills for their monthly service but who were nonetheless being charged for these unwanted services. Even if you find the charge details buried deep in the T-Mobile bill, it would often be listed with a nonsensical abbreviation like “8888906150BrnStorm23918,” that gives no indication that it’s a horoscope messaging service or some other scam that the user never signed up for. The FTC says that T-Mobile received indications of a probably as early as 2012 but continued allowing some of these charges at least through the end of 2013. Some consumers who complained were not given full refunds by T-Mobile, even though they had never authorized these subscription charges, according to the complaint, which states that some subscribers were only offered partial refunds of two months’ worth of the charges, while other customers were told to go after the scammers if they wanted full refunds. Of course, T-Mobile failed to provide adequate contact information for these scammers. The FTC’s complaint seeks a court order to permanently prevent T-Mobile from engaging in mobile cramming and to obtain refunds for consumers and disgorgement of T-Mobile’s ill-gotten gains. In a call with reporters to discuss the complaint, the FTC said that it tried to reach a deal with T-Mobile before filing with the court. “We did engage in settlement negotiations with T-Mobile, but were not able to reach a settlement, so we’ll be proceeding in court,” explained Jessica Rich, Director of the FTC’s Bureau of Consumer Protection, who advised that all consumers should read their bills closely and quickly contact any carrier when they see unauthorized charges. Additionally, consumers should consider requesting to block all third-party charges from their wireless contracts. “It’s wrong for a company like T-Mobile to profit from scams against its customers when there were clear warning signs the charges it was imposing were fraudulent,” said FTC Chairwoman Edith Ramirez.